The remains of stadiums, temples, and aqueducts indicate as clearly as any ancient document that the Roman Empire once existed. Likewise, fossils speak eloquently of a time when dinosaurs and not humans dominated Earth. Even without ancient ruins, similarities in appearance, language, customs, and genetic makeup show that the Italians, Spanish, English, and French all came from the same ancestral culture. Likewise, similarities in structure and genetic makeup persuade humankind that algae and plants, insects and crustaceans, chimpanzees and humans came from the same ancestral species. Evolution, which can be defined as the natural change in the inherited characteristics of groups of organisms, is as well established as the Roman Empire or any other event that is accepted as fact. Unfortunately, the common phrase "theory of evolution" has misled many people into believing that evolution is "only" a theory. To biologists, "theory of evolution" refers to a proposal about how evolution occurs, not whether it occurs. There are, in fact, several theories of evolution. Like evolution itself, some of these theories are well supported by observations and experiments. Evolution is generally associated with Charles Darwin (1809–1882), but by the time he wrote about it in 1858, it had already been suggested by many people. In fact, Charles Darwin's grandfather, Erasmus Darwin (1731–1802), was one of many who suggested that living species had descended from different species that had lived in the past. His theory of how evolution occurred was similar to that of French biologist Jean-Baptiste Lamarck (1744–1829) and was based on the belief that characteristics that develop in an adult can be passed on to its offspring. Thus, for example, giraffes could have evolved because their short-necked ancestors stretched their necks to reach higher leaves and therefore had offspring with longer necks. Both Lamarck and Erasmus Darwin were ignored, scorned, and ridiculed for this idea. Charles Darwin was well aware of the controversy over evolution. As a theology student at Cambridge University with a passion for biology, he heard his professors dismiss evolution as nonsense, and he saw no reason to doubt them. Between 1831 and 1836, however, while serving as naturalist on an around-the-world voyage of The Beagle, young Darwin made observations that convinced him that evolution had, in fact, occurred. He saw that the fossil animals in parts of South America were different from, but similar to, the animals still living there. This gave Darwin the idea that living organisms were descendants of extinct ones that had lived in the same place in the past. Darwin also observed that regions isolated from each other often had different but similar species. He noted, for example, that each of the Galapagos Islands had distinct species of mockingbirds. This suggested that all were descendants of the same ancestral species, and each had taken its own evolutionary path after being separated from the others. Darwin was also influenced by reading Principles of Geology by Charles Lyell (1797–1875). Lyell argued convincingly that geological changes were not caused by sudden global catastrophes, as most geologists then thought, but by gradual processes like erosion. This made Darwin realize that evolution must also have been gradual, otherwise organisms could not have remained adapted to their changing environments. 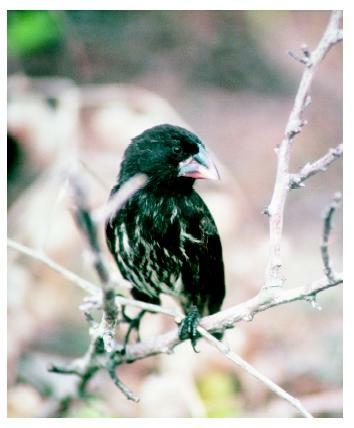 A cactus finch in the Galapagos Islands, where Charles Darwin began to formulate his theory of evolution. Darwin observed that regions isolated from each other often had different but similar species. Darwin eventually returned to England convinced of the reality of evolution. He knew, however, that no one else would believe it unless he could find a better theory to explain it than his grandfather and Lamarck had proposed. Since some of his relatives owned estates on which they had successfully altered domesticated animals by selective breeding, it occurred to Darwin that something like this artificial selection might explain evolution. But how could unconscious nature select which individuals would breed and which would not? Darwin studied agricultural journals, conducted breeding experiments, and pondered the question for months. Then one day in 1838 he decided to read ("for amusement," he says in his autobiography) the famous piece Essay on the Principle of Population (1798) by Thomas Malthus (1766–1834). The essential idea of this essay is now called the Malthusian Principle. It proposes that human population has a tendency to increase much faster than the food supply. Consequently, there will always be competition between those who can get food and those who cannot. Darwin saw in a flash that the same principle applies to all organisms. Virtually all species have the natural ability to produce many more offspring than can survive with the available resources. Within any species there will be some individuals that are better able to compete for food, mates, and other resources, and they will be more likely than others to produce more offspring. Scientists would now say that they have a greater fitness. To the extent that their fitness is hereditary, their offspring will also be better able to compete, and so on, generation after generation. In this way the fitter individuals become increasingly numerous, and the species gradually evolves. Darwin gave his theoretical mechanism of evolution the name "natural selection." Natural selection may be the simplest yet most powerful theory in science. With it one can immediately see that evolution is not only possible but, given enough time, inescapable. All that is required is that there be competition among individuals of the same species, and that individual organisms have inherited traits that make some better able than others to compete. Darwin must have realized the importance of his theory. Rather than risk his budding reputation with a hasty report to a scientific journal, however, he began to accumulate supporting evidence for a book. Twenty years later he was still at work on his book when a remarkable coincidence forced him to publish. In 1858 he received a manuscript from an English collector in the East Indies, Alfred Russel Wallace (1823–1913). As Darwin read the manuscript he was stunned to see that Wallace had hit upon the same theory of natural selection that he had been laboring over for two decades. Darwin reluctantly agreed to publish an outline of his ideas along with Wallace's paper. (It was discovered later that the basic concept of evolution by natural selection had already been proposed almost thirty years earlier by a little-known Scotsman named Patrick Matthew [1790–1874]. Matthew had also been ignored.) Ultimately, what finally made the words "evolution" and "Darwinism" well known was Darwin's book, On the Origin of Species by Means of Natural Selection, which was published in 1859. Its vast documentation and powerful arguments soon convinced the majority of biologists that evolution is a fact, and natural selection is one of the reasons why it occurs. Since the publication of On the Origin of Species, few biologists have doubted that evolution occurs. By the early twentieth century, however, natural selection appeared to be heading toward extinction. One criticism of natural selection was that any adaptation that made an individual only slightly more fit would be diluted when the individual mated. For example, if a giraffe ancestor with a slightly longer neck mated with a normal member of its species, their offspring would have necks with lengths between that of the two parents. This reduction in neck length would continue with each generation. Thus any adaptation would be blended out of the species before natural selection would have a chance to favor it. In addition, beginning in 1900, genetic mutation seemed to provide an alternative theory that was better than natural selection. The discovery of the work of Gregor Mendel and further research on genetics suggested that new species resulted from large mutations occurring within a single generation instead of small mutations being selected over many generations. By the middle of the twentieth century, however, biologists saw that Darwin's theory of natural selection was not really in conflict with genetics. They synthesized the two views, resulting in what is now called the neo-Darwinian or Synthetic Theory of Evolution. The neo-Darwinian theory was aided by a shift in thinking about the scale of evolution. Rather than conceiving of evolution as something that happened to entire species, biologists began to think of it as occurring within smaller groups of inter-breeding organisms, called populations. Most species comprise many populations. The size of the population is practically infinite. Individuals in the population mate at random. All individuals in the population have the same fitness, regardless of their genes. There is no gain or loss of genes due to immigration into or emigration out of the population. There is no new mutation in the population. Violating any one of these conditions can lead to a change in gene frequency. This is important because changes in gene frequency can result in evolution. In fact, many biologists now define evolution as any change in gene frequency. As an example, suppose a genetic mutation had caused an ancestor of giraffes to have a slightly longer neck. A departure from the Hardy-Weinberg conditions could continually increase the frequency of that mutated gene in the population. Gradually the entire population would have longer necks. This process repeated over thousands of generations could cause that population to evolve into the giraffe. The Hardy-Weinberg equilibrium therefore amounts to a list of conditions that, if absent, can cause evolution. The potential causes of evolution include small population size, nonrandom mating, natural selection, immigration and emigration, and mutation. Small Population Size. A change in gene frequency due to small population size is called genetic drift. Genetic drift is now recognized as one of the major causes of evolution, although its results are usually random rather than adaptive. Chance events operating in small populations can have huge effects on gene frequency. Imagine, for instance, an isolated population of a very rare, endangered species of mountain sheep, whose males have horns that are either curved or straight. If a severe snowstorm happened to kill the few sheep with genes for curved horns, the proportion of sheep with straight horns would increase greatly in future generations. A related phenomenon, called a population bottleneck, occurs when a large population is decimated by disease, predation, or habitat destruction. The few surviving members constitute the "bottleneck" through which the species passes. The genes of those few members dominate the gene pool of future generations. Similarly, a population of organisms could differ from others simply because the few founders of the population happened to have a gene frequency different from that of the species as a whole. This is called the founder effect. The wide differences in blood group frequencies between the Old Order Amish of Pennsylvania and other U.S. populations of European ancestry is due to the founder effect operating in the Amish population. The role of genetic drift in species formation is an important area of research in evolution. Nonrandom Mating. A second potential cause of evolution is nonrandom mating. Nonrandom mating usually occurs when individuals choose their mates. Animals often select mates on the basis of fitness, and the results of such sexual selection are indistinguishable from natural selection. On the other hand, mate selection can be based on characteristics that have nothing to do with fitness. For example, the tail feathers of the peacock or the bright coloration of the male pheasant are not thought to confer selective advantage in any arena other than mate selection. But because females choose the showier bird, the trait is selected for in males. This is called sexual selection. Natural Selection. Natural selection, which is due to hereditary differences in fitness, is a third potential cause of evolution, as Charles Darwin argued. Natural selection is now considered to be the main, if not the only, cause of the evolution of adaptations that increase fitness. For example, the speed of the gazelle and the cheetah that chases it are both due to natural selection. Immigration and Emigration. Immigration and emigration can bring in or remove particular genes. The global travel of human beings has increased the importance of these forces not only in human populations, but in many other species that travel with humans, such as Africanized honey bees. The so-called killer bees from Africa are currently changing the gene frequencies of bee populations in the southern United States. Mutation. Finally, mutation can obviously change the frequency of a gene. Mutation can be especially potent when combined with genetic drift in small populations. A petri dish culture of antibiotic-resistant Staphylococcus aureus . Resistance to antibiotics evolves when antibiotics are used improperly, allowing the survival of a few bacteria with mutated genes that confer resistance. nucleotides per human lifetime) to account for most evolutionary change without the help of natural selection. Also, contrary to what Erasmus Darwin and Lamarck thought, scientists know of no way that the efforts or experience of an organism can induce specific, adaptive mutations in its offspring. For a time, many biologists thought that natural selection was so rigorous that it would eliminate most mutations since most mutations were presumed to be harmful. Starting in the 1950s, however, it was found that genetic variations resulting from past mutations are quite abundant in most species. Most mutations have little effect on fitness, and they can accumulate generation after generation with little selection against them. With increased competition or some change in the environment, however, some of these mutations may result in differences in fitness. Natural selection can then bring about evolution by increasing the frequency of the beneficial mutations. Natural selection therefore seldom has to sit and wait for just the right mutation to come along and make an individual more fit. The mutations are usually already present in most populations. Changes in gene frequency that occur within a population without producing a new species are called microevolution. As microevolution continues, a population may become so different that it is no longer able to reproduce with members of other populations. At that point, the population becomes a new species. As the new species continues to evolve, biologists might eventually consider it to be a new genus, order, family, or higher level of classification. Such evolution at the level of species or higher is called macroevolution. Microevolution can occur very quickly; indeed, it is probably always occurring. For example, in less than half a century after the discovery of antibiotics, many bacteria evolved resistance to them. Resistance to antibiotics evolves when antibiotics are used improperly, allowing the survival of a few bacteria with mutated genes that confer resistance. 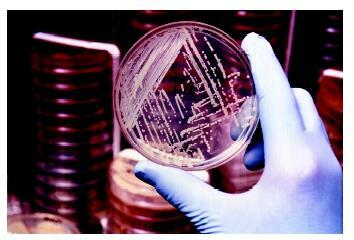 Natural selection then leads to the evolution of antibiotic-resistant strains. Pesticide-resistant insects and herbicide-resistant weeds are additional examples of rapid microevolution. Macroevolution occurs over much longer periods and is seldom observed within the human life span. Occasionally, however, scientists do see evidence that new species have recently evolved. There are species of parasitic insects, for example, that are unable to reproduce except in domesticated plants that did not even exist a few centuries ago. The pace of evolution can be quite variable, with long periods in which there is little change being punctuated by relatively brief periods of tens of thousands of years in which most changes occur. This idea that the pace of evolution is not always slow and constant is referred to as punctuated equilibrium . It was first proposed by paleontologists Niles Eldredge and Stephen Jay Gould in 1979, and it is one of many examples of how scientists' views of evolution are continually changing. Several possible mechanisms exist for rapid evolution. Chromosomal aberrations, such as breakages and rejoining of chromosomal parts, can introduce large changes in genes and the sequences that regulate them. This may lead to changes much larger than that brought about by simple point mutations. Environmental catastrophes can set the stage for rapid evolution as well. It is thought that the extinction of the dinosaurs was triggered by a large comet impact. This rapid loss of the dominant fauna in many ecosystems opened up many new niches for mammals, which at the time were a small group of fairly unimportant creatures. The sudden appearance of many new opportunities led to rapid and widespread speciation, in a process called adaptive radiation . Other areas of biology are also continually changing under the influence of evolution. For example, as Charles Darwin predicted in The Origin of Species, classification has become more than simply the grouping of organisms into species, genera, families, and so on based on how physically similar they are. Classification now aims to group species according to their evolutionary history. Thus two species that diverged recently from the same ancestor should be in the same genus, whereas species that shared a more distant common ancestor might be in different genera or higher taxonomic levels. Until the 1980s, evolutionary history, or phylogeny, of organisms could only be inferred from anatomical similarities. Since that time, however, it has been possible to determine phylogeny from comparisons of molecules. Often this molecular phylogeny agrees with the phylogeny based on anatomy. For example, about 99 percent of the sequence of bases in the deoxyribonucleic acid (DNA) of chimpanzees and humans is identical. This finding confirms the conclusion from anatomy that chimpanzees and humans evolved from the same ancestor only a few million years ago. Such agreement between anatomical and molecular phylogeny would not be expected if each species were a totally different creation unrelated to other species, but it makes sense in light of evolution. It is one of many examples of the famous saying by the geneticist Theodosius Dobzhansky (1900–1975): "Nothing in biology makes sense except in light of evolution." Dawkins, Richard, The Selfish Gene. Oxford: Oxford University Press, 1990. Freeman, Scott, and Jon C. Herron. Evolutionary Analysis, 2nd ed. Upper Saddle River, NJ: Prentice Hall, 2001. Stanhope, Judith. Hardy-Weinberg Equilibrium. <www.accessexcellence.org/AE/AEPC/WWC/1994/hwintro.html> . While in the Galapagos, Darwin did not come up with any answers as to why the forms of life were so different in those remote islands from the rest of the world. But a couple of years later, in 1837, he wrote the following in his journal: "In July opened first notebook on transmutation of species. Had been greatly struck from about the month of previous March on character of South American fossils, and species on Galapagos Archipelago. These facts (especially the latter) are the origin of all my views." English-born naturalist and explorer who helped formulate the principles of biological evolution and natural selection. Wallace traveled more than 14,000 miles in the area that is now known as Indonesia and Malaysia and catalogued more than 125,000 biological specimens. Professor of mathematics at Trinity College and the University of Oxford and a leading mathematician who recognized, shortly after Weinberg, the relevance of Mendel's laws of inheritance to the study of population genetics. German physician, geneticist, medical statistician, and early founder of population genetics who demonstrated the importance of Mendel's laws to the genetic composition of populations. The Africanized honey bee was first found in the United States near Brownsville, Texas, in 1990. Since that time, the bees have spread throughout the state. They've also been found in Arizona, California and New Mexico.